Downtown Bible meets every Wednesday at 12:15pm in the Sunken Ballroom of the Mark Building located at the corner of SW Park & Main in downtown Portland. 1119 SW Park Ave Portland, OR 97205-2430. 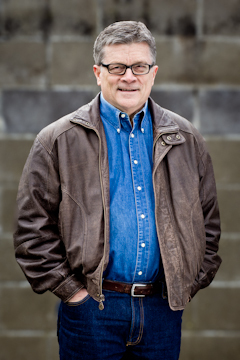 Scott Gilchrist has been Senior Pastor at Southwest Bible Church in a suburb of Portland, Oregon since 1979. He is a frequent speaker at conferences and has a passion to see God’s Word taught and understood. He is heard daily on the radio broadcast “Downtown Bible Class” and teaches the Bible to the business community in downtown Portland each week at the Portland Art Museum. He was awarded an honorary Doctorate by Western Seminary in 2007. He and his wife Kristi were married in 1974 and have five grown children and a growing number of grandchildren. Yes, I'd like to help Downtown Bible bring clear, Christ-centered Bible teaching to the marketplace. Use my gift to help cover expenses for your radio, internet, and weekly Bible class ministries.